In what may initially confuse some, Samsung recently announced the Galaxy Note 10.1 as well as the Galaxy Note II, which is due for its local launch tomorrow. 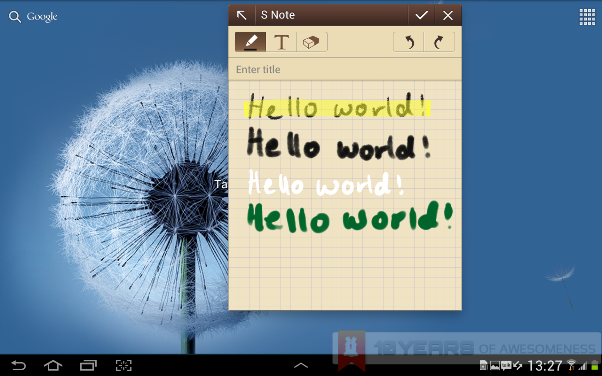 In the meantime, here’s our preview of the Galaxy Note 10.1. Hit the break for more! The tablet scene today is filled with 10.1-inchers with little to differentiate between them. Samsung, interestingly, decided to introduce a stylus for its new tablet. Called the S-Pen, it actually is slowly changing the way we see tablets as productivity devices, rather than just a large tablet to play games and watch movies with. Of course, one such tablet is Samsung’s own Galaxy Tab 2. So how is the Galaxy Note 10.1 different from the Galaxy Tab 2? Besides the inclusion of the S Pen, at 262 x 180 x 8.9mm and weighing 600g, it is both larger and heavier than the Galaxy Tab 2. 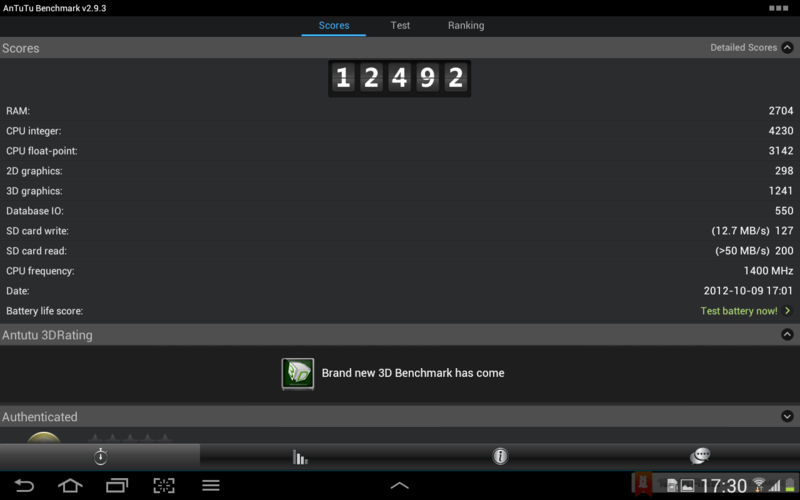 However, there’s also double the memory, with 2GB of RAM in the Note 10.1. Samsung’s also increased the size of both cameras in the Galaxy Note 10.1, with a 5MP rear shooter with LED flash coupled with a 1.9MP front-facing camera. Finally, the biggest bump in specs is the upgrade to Samsung’s quad-core 1.4GHz processor. This 10.1 inch, 1280 x 800 LCD tablet can also support up to 64GB external storage via microSD cards, and also has USB host support. In addition, there is also an IR transmitter that can be used in the Smart Remote app as a universal remote control. In addition, Samsung is really pushing the usefulness of the S Pen, with the inclusion of several S Pen-centric apps, such as S Note, S Planner (essentially an interactive calendar), and Family Story, with the promise of more S Pen-optimized apps available via the Samsung Apps portal. There is also a copy of Adobe Photoshop Touch, which can be used with the S Pen. Finally, there is the much-hyped Multiscreen feature on the Galaxy Note 10.1. For supported apps, users can run two apps simultaneously side by side on the screen. The S Pen, on the other hand, is essentially a souped-up stylus. Samsung went to great lengths to integrate the use of the S Pen into the interface, and while some parts are rather redundant (there’s a dedicated screenshot capture button on-screen, but you can also capture screenshots by touching the S Pen to the Note 10.1’s screen and pressing the S Pen button), using the S Pen feels pretty intuitive as well. 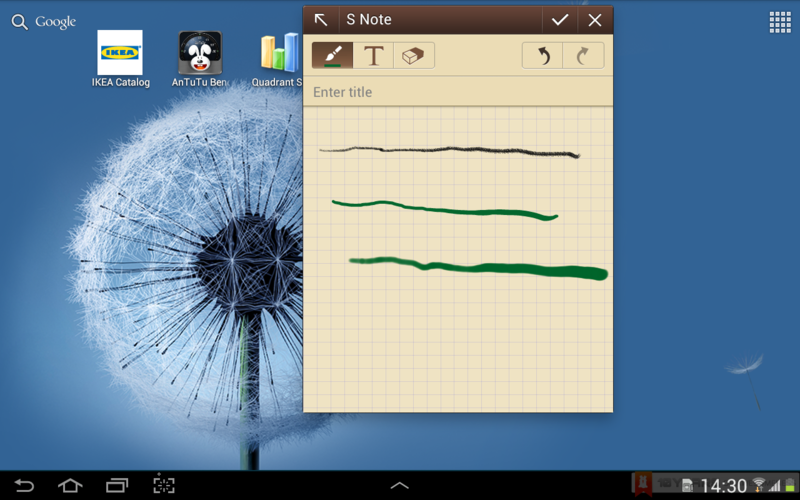 The memo app, called S Note, utilises the S Pen and allows for remarkably accurate handwriting. The S Pen is also pressure-sensitive, which should have other uses in the future besides displaying thick or lightly shaded handwriting. 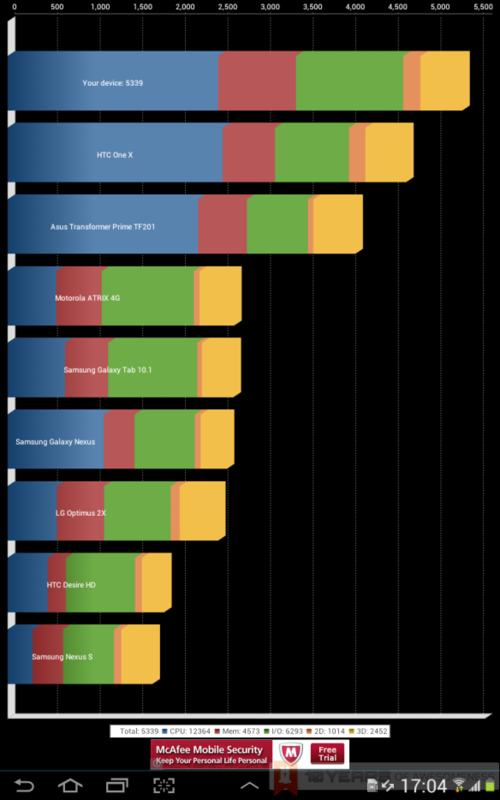 We’ll be covering more detailed aspects of the Galaxy Note 10.1 that were not covered here in our review coming up soon. Stay tuned!